Filipino Catholics participated in a novena of Masses as a form of spiritual preparation in the nine days leading up to Christmas. This tradition was introduced to the Philippines by Spanish friars to allow the farmers to hear Mass before going to the fields early in the morning. Simbang Gabi is also known by its popular Spanish name as the Misa de Gallo, or “Mass of the Rooster,” commonly indicating the pre-dawn Christmas Eve Mass. The novena serves as spiritual preparation for Christmas, in commemorating the birth of Jesus Christ. The celebration is also seen as a way of requesting blessings from the Lord, as most people believe that if one completes the whole series of nine dawn Masses, wishes will be granted. 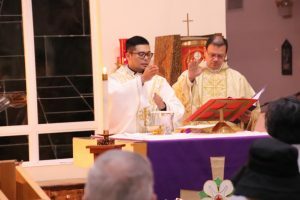 The complete novena was held at St. Maximilian Kolbe Parish in Port Charlotte, with the opening Mass celebrated by Pastor Father Teofila Useche and Father Kristian Villafana, Parochial Vicar of St. Leo the Great Parish in Bonita Springs. 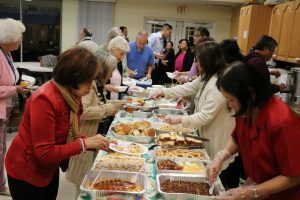 Celebrated in Tagalog, the language known by most Filipinos, Masses were also celebrated on one day of the novena period at Incarnation Parish in Sarasota (Dec. 16), St. Andrew Parish in Cape Coral (Dec. 16), and at St. Leo the Great Parish (Dec. 21). Although this tradition is not exclusive to Filipinos, its observance is very much highlighted and distinctive of the Philippine Catholic culture. Father Villafana explained that the Vatican allows the Simbang Gabi Masses to differ from the traditional Advent Season readings and requirements. This exception allows the readings to be directly associated with the Christmas Season and the Church is also decorated while the priests wear white vestments. This is an important and growing Catholic tradition as the faithful prepare their hearts waiting for that dawn when the sun rises, Father Villafana added. The sun rise is associated with Jesus Christ, bringing with it new hope, new life. “We are living that moment in joyful and hopeful anticipation,” Father continued. Father Villafana added that it is believed that participating in the novena of Masses brings many blessings. Some believe that if you attended the Simbang Gabi you would find your future spouse, which naturally increased the popularity of the tradition. Following the daily Masses, a reception is held serving traditional Filipino delicacies including rice cakes, pastries, coffee and breakfast rolls.